Last night, a mob of around 30 or so people surrounded the private house in Shurnukh village (Syunik region, Armenia) where 9 LGBT activists gathered, and then attacked activists by chasing them along the highway, insulting, beating and stoning them. BREAKING: Today, on the 3rd of August, around 20:00, in Shurnukh village, Syunik region, more than 30 people attacked 9 LGBT activists and beat them. As a result, 2 of them were hospitalized with different corporal injuries. Others 7, who had minor corporal injuries, are currently in the police station. The police arrived to the place of crime around 21:30, more than an hour after the activists have called them. Representatives of PINK Armenia went to Goris. The Ombudsman representatives also went there. We will provide updates if there are any news. We are calling upon the police officers of Goris Police firstly to ensure the safety and security of the activists, as well as undertake the appropriate measures to find and prosecute the perpetrators. UPDATE 23:00 - 7 people, who had minor corporal injuries, are now being taken to hospital for medical check. Apparently, some of the main attackers knew 2 of the present LGBT activists and insulted them with the hate speech few months ago in Goris too, but police did not act on it back then. What kind of dark ages these people live in? Violence became a norm that is not just tolerated but also encouraged by some especially against anyone who is different or perceived LGBT. Unfortunately, Velvet Revolution government has so far been silent re LGBT discrimination, and this sends a wrong signal that anti-LGBT attacks could be tolerated. They should send a very strong message that no violence, no human rights abuses, including based on sexual orientation and gender identity will be acceptable in New Armenia. Instead, no single minister up to now used the wording “LGBT” or “նույնասեռական”, even when responding to LGBT related question. Even human rights ombudsman’s office on their FB page vaguely referred to what happened in Shurnukh as ‘incident in Shurnukh’ without further elaboration as to what this ‘incident’ was about. Until this situation changes, all those key government messages - spearheaded by PM Nikol Pashinyan - asking Armenians to return to Armenia will remain shallow and unconvincing. 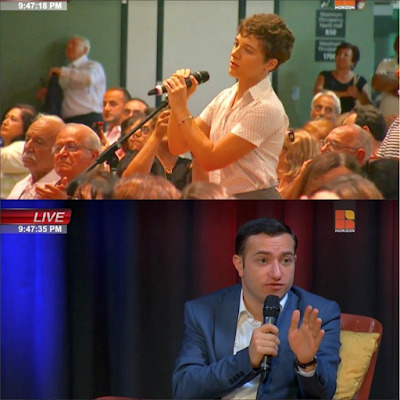 Kudos to @galas_la member Nicole Yeghiazarian @anam0t for asking Armenia’s Minister of Diaspora @mkhitarhayrapetyan what the new administration’s plans are for making sure LGBT Armenians are safe in Armenia. Although the Minister’s answer was not specific, in essence he said that they’re working towards creating Armenia where “...all human rights are protected”. Disturbing reports about #hatecrime attack against 9 LGBT activists in #Armenia's Syunik region, several injured. "It seemed that we wouldn't survive," says one of the activists. Prompt & thorough investigation needed!